Freelance writer and blogger from Sydney (ex-Melbourne). Avid foodie and traveller. Loves dogs. 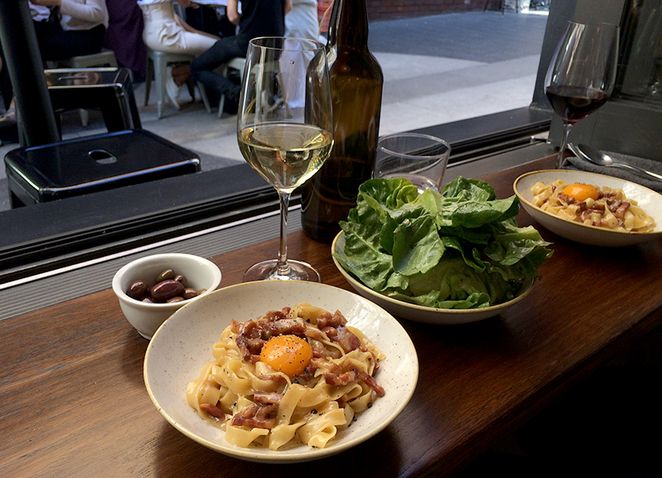 One of my favourite places to eat, drink and people watch is Dear Sainte Eloise in Potts Point. Situated in front of Room 10 on Llankelly Place, DSE is a wine bar that is run by the same crew as Love, Tilly Devine in Darlinghurst. DSE began its life as Waterman's Lobster Co before the owners decided to call it quits. Consequently, Waterman's became Dear Sainte Eloise, a charming wine bar with a predominantly European wine list and a lovely menu to boot. Although DSE is more of an after dark date place, it's worth coming in during the day. And if you come for lunch from Friday to Sunday, I highly recommend you take advantage of the $25 pasta lunch. 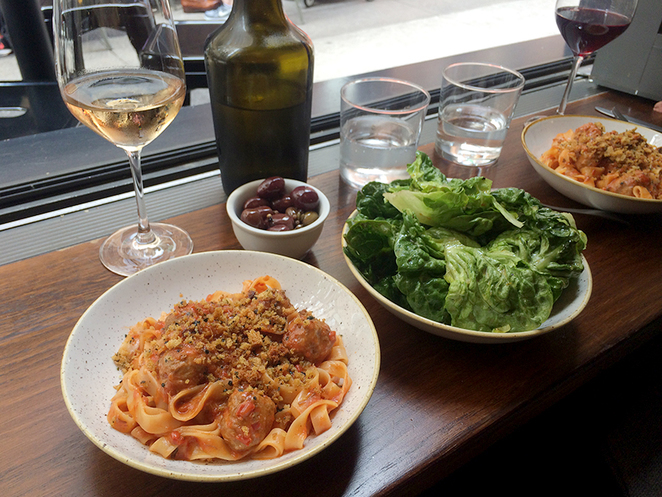 At $25 per head, you get a little plate of olives, a salad (usually cos lettuce or radicchio with a light dressing), a plate of pasta and a glass of mystery wine. There is always one meat pasta and one vegetarian pasta to choose from. As for the wine, you can choose between a white or a red and they pretty pour out whatever's still open from the previous night. It could be a Riesling from South Australia or a Chenin Blanc from South Africa… or something completely random like a natural wine from Georgia. Every few weeks, they'll have carbonara on the menu, usually with tagliatelle but occasionally with spaghetti or rigatoni. It's one of the best renditions of a carbonara I've ever had. The dish itself isn't large but it's rich enough to make you happily full. Think thick pieces of guanciale, lots of cracked black pepper and a shiny golden egg yolk on top. It's simple, tasty and probably not good for you but hey, what are weekends for, right? I'm not someone who likes to return to a venue more than once a fortnight, but we often find ourselves enjoying a weekend lunch at DSE. 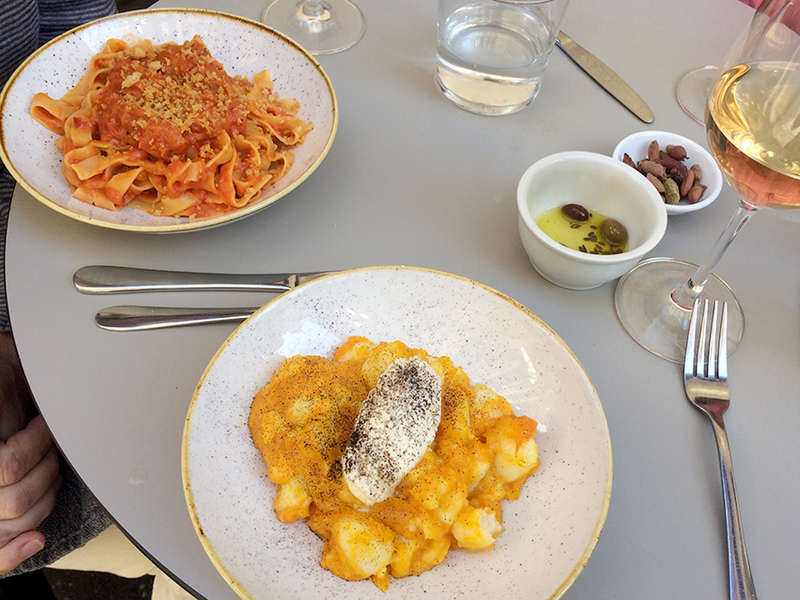 Not only does the $25 pasta lunch represent good value (especially in Sydney! ), they also pour excellent wines. Love Potts Point, Love a good pasta and love wine, must try this place. Sometimes simple, unpretentious things are the best. Nice article, great pics, food looks yum.